I was pleased to find this write up on the Benefits Pro website based on on our session at the SHRM Diversity and Inclusion conference. Kathryn Mayer, the reporter captured 10 ways to create an introvert- friendly workplace. She drew from our presentation but also listened to the feedback of the group as these Diversity and HR leaders shared their own techniques and tools. 1. 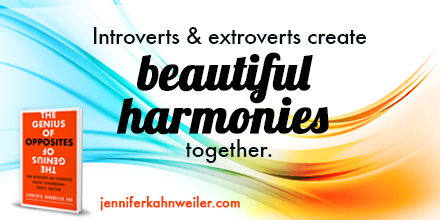 Know who your introverts are. First, HR representatives and managers should know just who their employees are and what type of personality they have.That will give them a better foundation for a relationship and a better way to gauge how they contribute, communicate and excel. As HR professionals and employers recruit and interview potential employees, acknowledge that the process might not be introverts’ biggest strength. “Just because they are nervous or avoid eye contact doesn’t mean they can’t do the job,” she said. The same tactic goes for current employees. Introverted employees might not contribute a lot to certain conversations or make a lot of small talk, but that doesn’t mean they’re rude or not willing to contribute. You might also find this article about training introverts of interest too. Is your learning introvert friendly? This entry was posted in Uncategorized on February 23, 2016 by Jennifer Kahnweiler. Jennifer is an absolute joy to work with and is very creative and detail-oriented. She’s always brimming with out of the box ideas and suggestions to improve workflow and products!